In his first year as the general manager of the Vancouver Canucks, Jim Benning learned a crucial lesson about the importance of defensive depth in the Western Conference. It’s an interesting statement, and for a variety of reasons. Let’s unpack this on the other side of the jump. The Canucks used 10 defenseman at the NHL level this season, and even limped through a crucial two week stretch with a second pair that featured Alex Biega and Luca Sbisa. All in all, one might reasonably conclude that Vancouver’s defensive depth held together pretty well, although it helped that Eddie Lack went supernova in late February and early March, helping the club stay afloat in the absence of Alex Edler and Chris Tanev (among others). Well, I’ve said it many times that a competitive team like ours, if you want to build a team that has a chance you’ve got to have depth on the blueline. When we set out to build the team we billed our model with 8 defenseman on the NHL side, but we also sought out players who were going to be 9th, 10th, 11th guys who had the ability to play in the NHL. So Benning’s newly learned approach, as it turns out, is consistent with something the organization has been doing for years. In recent seasons the club has occasionally managed to build an absurdly deep blue line group with players like Chris Tanev, Aaron Rome, and Ryan Stanton paying off as no-risk gambles. Other times they’ve leaned on players like Cam Barker and Marc-Andre Gragnani who weren’t quite so effective (to put it kindly). Benning’s commitment to building a deep blue line could have far reaching ramifications for how this upcoming Canucks offseason plays out. The blue line is an obvious area of need for the club, particularly because of the way the Calgary Flames thoroughly smothered the Canucks’ breakout in the postseason. It’s also an area of surplus. The club has nine defenseman who will require waivers next season and only eight blue-line spots on the roster. That group of nine defenders includes five right-handed players in Kevin Bieksa, Chris Tanev and a trio of restricted players: Yannick Weber, Frank Corrado and Adam Clendening. Jamieson’s piece notes that Corrado can play the left side, as he did a fair bit while paired with San Jose Sharks draft pick Justin Sefton with the Sudbury Wolves of the OHL. That said, Corrado has spent 89 percent of his 5-on-5 icetime at the NHL level paired with players who generally play on the left side. I’m skeptical that the Canucks really see him as an option at LD. In terms of projecting what comes next for the Canucks on the blue line, we know that the club will explore using their depth in goal to recapture draft picks. I think we should probably assume that something similar could be in the offing on defense. Whether it’s a veteran on an expiring contract, like Dan Hamhuis or Kevin Bieksa, or one of the club’s four restricted defenseman (the three right-handed players, and Ryan Stanton), it would seem that the club should probably look to carve out some room, and ideally before they’re over the barrel during late-September/early-October’s waiver wire season. Benning indicated that he’s willing to take his time and also explore his options on the trade market. 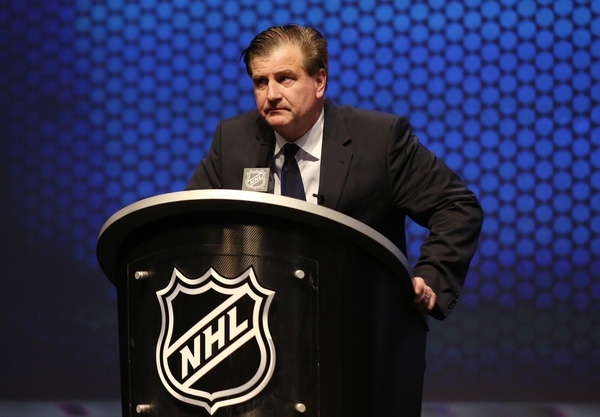 As for free agency, Benning suggested that the Canucks could kick the tires on unrestricted defenders. Vancouver hockey fans may not want to get too excited about the prospect of adding Cody Franson though, as Benning is more likely to be dumpster diving than wooing any big names. Vancouver’s general manager has repeatedly insisted this offseason that the club hasn’t made any decisions on how they’re going to proceed yet and won’t until they convene their full team of scouts and executives following the NHL scouting combine in early June. So it’s not surprising that most of the quotes Benning gave Jamieson this week are vague and philosophical, rather than specific. They do hint at a couple of major priorities though, namely that the club wants to upgrade their transition game from the blue line, will only roll with eight defenseman on their 23-man roster, will be lower-end bidders in free agency and will prioritize organizational defensive depth. Taken altogether, we’re probably safe in assuming that some back-end renovations are coming. – with h/t to Jason Brough. Read Jim Jamieson’s full piece here. Nothing turns me off faster than that same GM signing one of the worst D in the NHL to a 3.6 million contract and thinking he’s a legit top-4 option. Welcome, Jim Benning, to the terror dome. You’ve had it easy so far in canuckville. Now the shine has worn off,the brilliant draft master has piddled away picks so far, has had the chance to have a signing or two look bad,made some interesting contract/cap management decisions in Sbisa’s contract, a trade for draft picks in Vey look dumb….and now the knives are coming out a little. Welcome to the GM position of the Vancouver canucks. You’re now finally really gonna get baptized in the fire that is a Canadian market. Win nothing, someone gets fired, fans keep coming back.in nothing, someone gets fired, fans keep coming back.in nothing, someone gets fired, fans keep coming back.in nothing, someone gets fired, fans keep coming back.in nothing, someone gets fired, fans keep coming back.in nothing, someone gets fired, fans keep coming back. Yes, you’re completely right, Vancouver fans should be criticized for supporting the team despite the team not winning championships and only being highly competitive for a decade. There’s not a single team in pro sports — not the Leafs, the Cubs, the Red Sox, the Packers, the Blues, the Suns, etc etc — that have had lengthy droughts and yet their fans keep coming back. There must be something fundamentally wrong with all of those people and their cities and they should acknowledge they are bad people. How wise you are. Why are you so called Cancusk fans ALWAYS comparing mediocrity to CRAP? If you get charged with assaulting your spouse do you say that it’s better than the next guy who murders their spouse? Oh look, we haven;t won a thing in almost 50 years of mediocrity but you should take it and accept it because there’s things worse than us. My friend, here’s the straight talk so you understand. QUIT LOOKING AROUND FOR EXCUSES WHEN THE FINGER IS POINTED AT YOU. TAKE CRITICISM LIKE A MAN. JUST BECAUSE YOU LOST 46 RACES INSTEAD OF 49 DOESN’T MAKE YOU LESS OF A LOSER AND A WINNER. YOU HAVE NO STANDARDS, PERIOD. Proof reading can be your friend. Just let him in and use him. Butthead. Why would I need to proof read when retards like yourself do it for for free on he net? That was a lazy cut & paste, sir. Good day. That’s why i cut and pasted, because I’m LAZY. If I wasn’t lazy, i wouldn’t have cut and pasted. Do you go downtown to ask homeless why they’re always dirty as well? But thanks for the obvious, Captain Obvious. You are welcome. And thank you for assuming that I am a Captain, however I think it’s only fair to let you know that I have never been granted an official rank. Although people routinely address me as “sir” all the time in restaurants and on airplanes and at 7-11… I think I must exude an air of authority. So don’t feel bad, happens all the time. he’s not nearly one of the worst D in the NHL .. 3.6 is nothing in a new cap era and if you really have a clue about sbisas skill level and potential, then just ponder the fact that on an ideal canucks team in the near future, sbisas the perfect spark on the back end. don’t need to expect him to play 82 games a season on our squad in the future when benning’s focus is improving our depth on defense. sbisas the type of player that can come back after being a healthy scratch and be your best defenseman in a single game, whether you want to admit it or not. if you CAN have the luxury of having enough depth for that, then suddenly it’s not an issue in any way, it’s really a luxury. Depth will always be a concern for NHL clubs. Canucks need to maximize their pairings. Bieska and Sbisa was a brutal pairing. Trading Juice and pairing Hammer with Sbisa could be a remedy. Luca needs a steadier partner than Juice. Could minimize his brain farts…..Could? Better to pair Hamhuis and Bieksa and ditch Sbisa. It`s important to have depth on defense but Benning has blundered badly by making these thoughts public. Sure come to Vancouver – you can be number 10 on our depth chart. Andersson is going back to Sweden. McNally won`t sign here. Players like Sanguinetti will leave if they can. Benning will be scraping the bottom of the barrel for minimum wage players because any player who wants to make it to the NHL will only sign with Vancouver as a last resort – and yeah that includes Cody Franson. I think Bobby and Biega were happy they signed with Van. They both got NHL pay days. Most AHL dmen would do back flips to get a shot at playing games in the NHL or even being on the roster getting an nhl salary. Hey now, Sbisa is great at transitioning the puck to the opposition. This is all well and fine for Benning to say (and really every team probably has at least one or two in the minor that COULD play at the NHL level — though whether or not it’s well is another matter). But while moves like Clendenning and Subban mesh with this philosophy where on earth do Sbisa or a dud like Stewart play into this? It’s just weird to hear Benning say stuff like that and then look at the Sbisa contract. His tenure so far has been so contradictory. ‘Meat and Potatoes’ and signings/draftings like Mackenzie Stewart. Then he goes and gets someone like Baertschi. Is he trying to have a few bob each way or what?